PCB Piezotronics, Inc. launches The new 1/2" Random Incidence Microphone, model 377C20 from PCB Piezotronics is used in noise reduction testing. Random Incidence microphones, also known as Diffuse Field microphones, accurately measure multiple sounds that come from different directions or sounds in rooms with reflective surfaces. This microphone meets the IEC 61094-4 standard for test and measurement microphones with a frequency range up to 16 kHz (+/- 2dB), the hearing range for most adults. It is ideal for general room acoustics measurements as well as testing in aircraft cabins, automobile interiors and for calculating transmission loss with different materials. Random Incidence microphones are commonly used for general omni-directional sound pressure level measurements. Performance venues such as music auditoriums or church halls use these microphones for measurements that aid in acoustic room design. Strategic placement of the sound source, furniture, sound absorbing materials, etc. are all factored into a venue's design and help make the sound quality more pleasing to the audience. 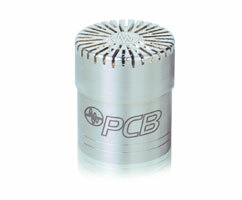 PCB carries a full complement of externally polarized and prepolarized condenser microphones and preamplifiers. Prepolarized microphones use standard coaxial cables and are ICP® compatible, allowing power supplies to be shared with other ICP® compatible products such as accelerometers. This compatibility provides a significant per-channel cost savings as well as reduces test set-up time. The 377C20 Random Incidence Microphone is A2LA and ILAC accredited. All PCB products come with a "Total Customer Satisfaction" guarantee. Microphone model 377C20 is in stock and available for immediate shipment. For additional information please contact Mark Valentino, Product Manager, at (866) 816-8892 or via email at mvalentino@pcb.com .